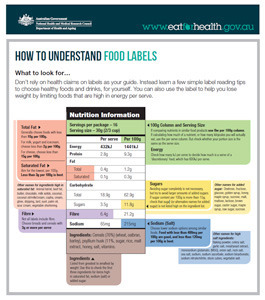 In Australia, the law requires all manufactured foods to carry labels containing safety and nutrition information. This information helps you to make decisions about the food you buy and eat so you can follow a healthy diet. Some labels tell you what percentage of the recommended daily intake is provided by one serve of the product. This helps you to work out how the food fits into a balanced diet. Read more about recommended daily intakes for adults and recommended daily intakes for children here. The label may make a number of nutrition claims such as 'gluten free', 'low GI', 'low fat', 'reduced salt' or 'high fibre'. These mean the product meets strict criteria set by the government. But just because a product can make a nutrition claim doesn't mean it is healthy. For example, a product that is 'low fat' may have more kilojoules than another similar product. Check the Nutrition Information Panel to see how the product compares. The Nutrition Information Panel tells you the size of a standard serving of the product and which nutrients are contained in that serving. You can use the label to compare the product with what's in similar packaged foods. The Health Star Rating on the front of the pack is designed to help you choose healthier foods at a glance. Packaged foods are rated at between ½ and 5 stars. The rating is calculated according to ingredients that increase the risk of obesity and contribute to other chronic diseases. The more stars, the healthier the product. By understanding food labels better, you can make healthier food choices when shopping for food and make nutritious meals for both you and your family. Food labels have so much nutritional information that they can be very confusing. Our guide makes food labels simple so you can make healthy choices. Kids' Health - Topics - Food labels - what do they mean? This page offers tips when buying healthy foods on a budget, along with how to tackle pester power and read food labels. How do you eat more good fats and cut bad fats out of your familys diet? Get practical tips to help you choose foods and serve meals with healthy fats.